First, a bit of business: Flannel Friday needs needs volunteers to host the roundups January 25 through March 15. If your blog has participated in Flannel Friday three or more times, you’re qualified! Sort Some Socks with Miss Mary Liberry. That reminds me, I need to get my laundry out of the dryer! ok, that’s done…thanks for the reminder Miss Mary! Oh cool! Check out these awesome Felt Library cards from Abby the Librarian! Library Quine of Loons and Quines offers a couple of snowman flannel boards, including a very dapper snowgent (Think Don Draper, but with a carrot nose). Seth of The Voices Inside My Headphones offers this existential flannel board about a rooster to breaking the monotony of farm life: 10 Sleepy Chickens! Love it! Meghan of Busy Crafting Mommy to make her own delectable version of a Flannel Friday classic: 5 Little Apples. Can’t…type…must…go…on…phew! that was rough. I got weak from acute cuteness exposure… Get ready to melt when you see world’s most adorable dragons. Bridget of What’s Bridget Reading offers 5 Little Dragons. There’s a Fat Cat on the loose In The Children’s Room. Lucy has captured the madness of this Scandanavian folk icon with a larger-than-life, wild-eyed, hot pink feline. Lisa of Libraryland offers The Runaway Cookie Parade from a classic storytime resource. The Complete Books of Activities, Games, Stories, Props, Recipes, and Dances by Pam Schiller is a must-read for storytime presenters. Jeanie of Totally Toddler A Good Name For A Teddy Bear. I never would have thought of making this into a flannelboard, Jeanie. I am definitely going to make this for my next Teddy Bear Sleepover. Annie of So Tomorrow made a shadow puppet version of a book I one my all-time favorite books from childhood Mother, Mother, I Feel Sick. Tracey of 1234 More Storytime asks her storytimers to decide which animals are cuddly in this Yes Day by Amy Kraus Rosenthal. Oh, and I almost forgot here’s my version of Stuck by Oliver Jeffers. I never would have attempted this one if @nikarella of . 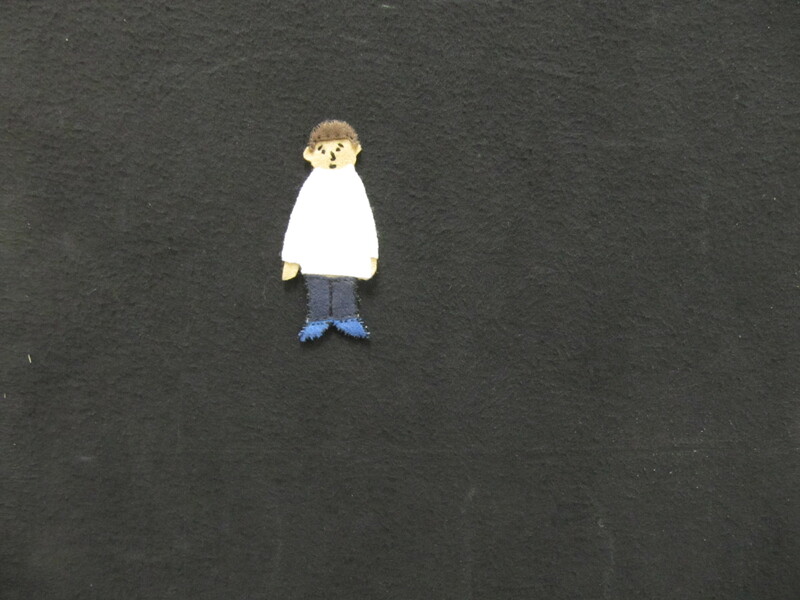 (and while this requires a ton of cutting and magnetizing, I’m posting a pdf of the this magnet board, because it actually works great in storytime. If you haven’t tried Sharon’s version of Too Much Noise using musical instruments to represent the various sounds, you should add it to your next storytime. 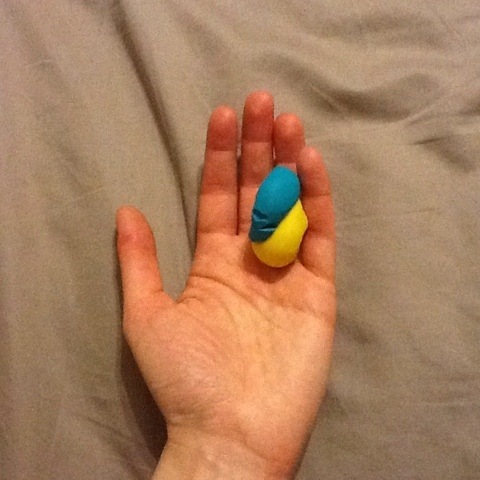 I tried it about a month ago in my campfire sing-along program. It was awesome. 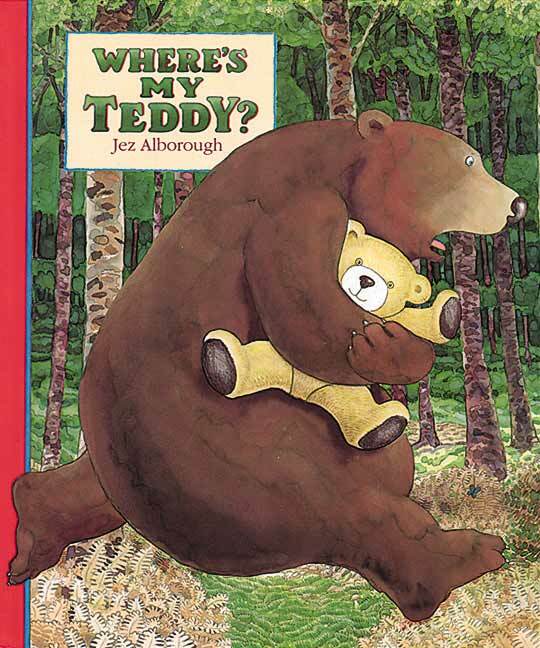 This is one of my all time favorite storytime books. Garcia’s concept and execution is flawless. 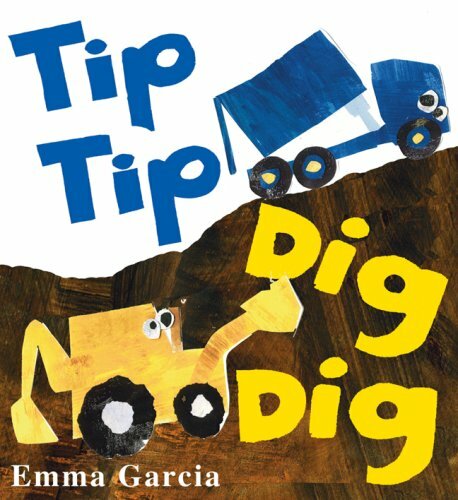 In the past I’ve always made big motions to signify the tipping, digging, mixing, etc. And it’s always been a big hit. However, the instruments really brought the story to life. First I scanned, printed and laminated the adorable machine dudes from Garcia’s illustrations so that I could give each group a visual reminder of which instrument went with each machine. So thanks Sharon the brilliant prop story idea! Check out the FFRU! This weeks host is by Amanda at Toddler Tales. Learn more about Flannel Friday visit our blog. Flannel Friday: Where’s My Teddy? I love this book. And this is a pretty simple flannel board. 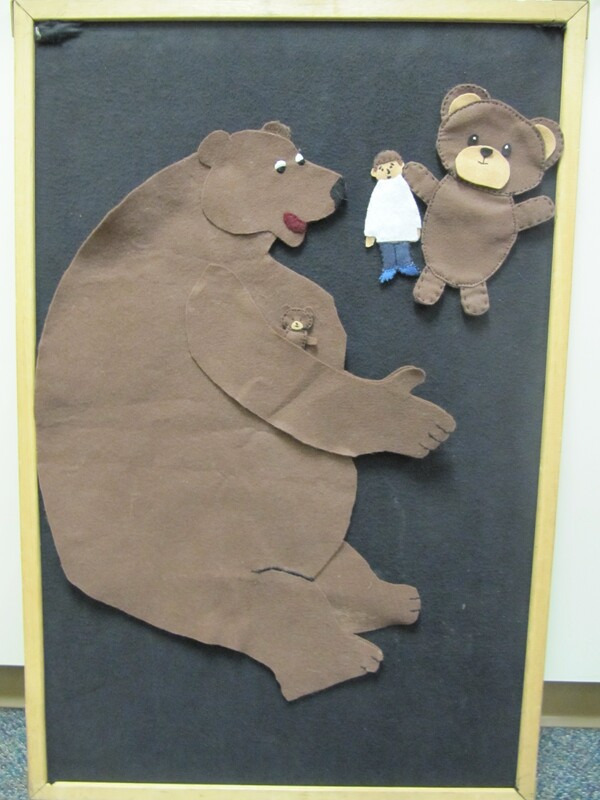 There are only 4 pieces, but I made the bear big enough, that it’s risky to put all the pieces on one board. 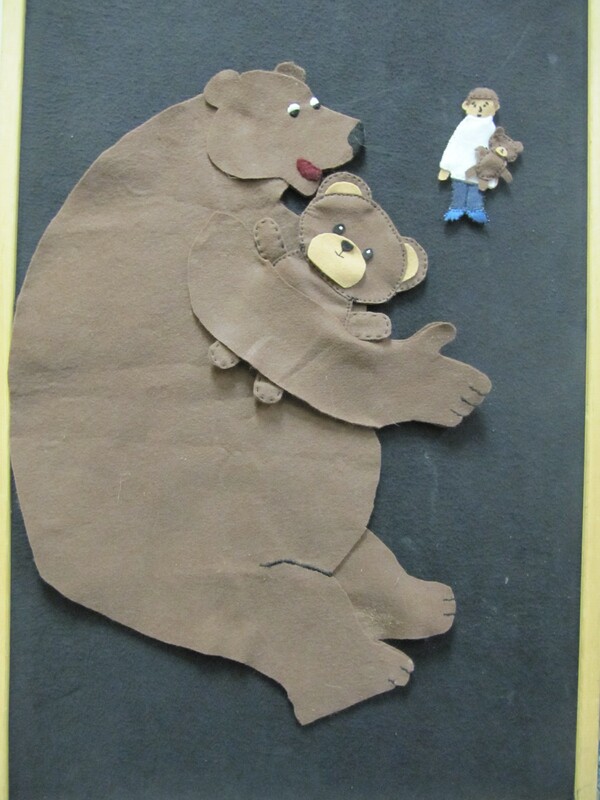 It’s too easy to knock all the pieces over when you’re switching the bears between the bear and the boy. So I use 2 boards side by side (even though the photo shows them all on a single board.) Also, I usually have the book on hand. The rhythm of the story is just one part of what makes this an awesome read-aloud, but it’s a pretty important part. I don’t have a pattern for this one, but I could take a shot at making it from the pieces. 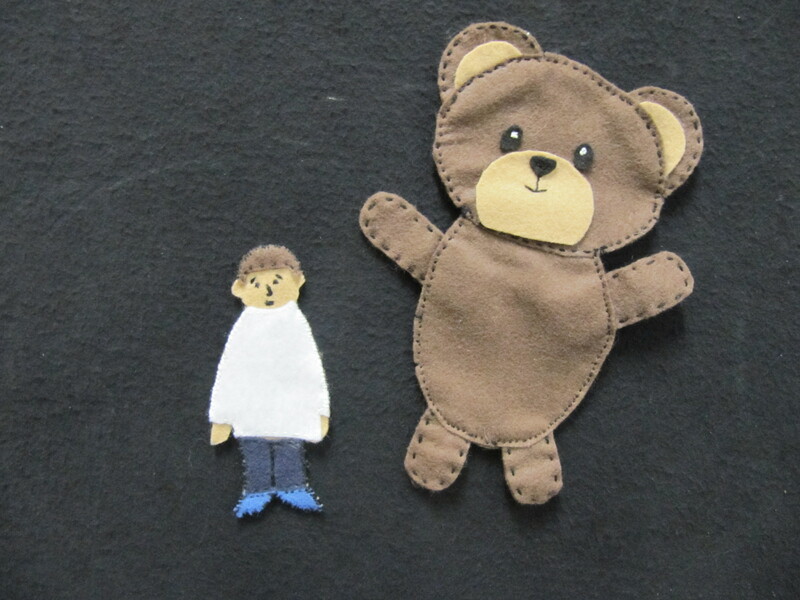 I sketched them freehand, and and cut the felt using my drawings. Uh oh! Wait, what that sound? How did you get to be so small? Oh, that make more sense! And they each run home, jump into bed (I made a blanket to tuck them both in at the end, but I may have repurposed the felt for another story at some point. Katie is our adorable host this week! Mollie and Amy have done some retooling of the pinterest page. Thanks ladies! Check it out, and let them know what you think on the FB group. So, I’m late this week, but better late than never, right? 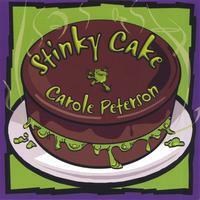 This week’s must-have music is a doozy: Stinky Cake by Carole Peterson. One of my storytimers loved this album so much she put it in her teddy bear’s backpack. Her lovely grandmother tore the house apart looking for it, paid the fine. She only stumbled across it as they were packing the teddy bear for a pretend camping trip. I’d already ordered a couple of copies, and have no regrets. In fact, we’re having the marvelous Miss Carole perform at this library in June! Squeee!! This is one of the must-havingest CDs ever! It’s wall-to-wall storytime hits. Ok, CD’s don’t have walls, but you know what I mean. This album has 4 awesome movement songs. Track 2 Shake a Friend’s Hand would make a great hello song, but it would also fit a friendship storytime. Track 13 Partner Dance would would also make a good fit for a friendship storytime. But this song is better with older kids who know each other well. Kindergarten is an ideal age. They need to be old enough to follow directions, and confident enough to switch partners. Track 4 Everybody Clap Your Hands perfect for opposites storytime, but it’s also a fun mid-storytime dance break no matter what the theme. Track 11 B-banana/Monkey See, Monkey Do is a double-feature that is exactly what it sounds like. So get ready to set your inner-monkey free for this follow-me song. Thumbs Up! or All You Need Is Thumb! You’ll always have the right props on-hand for two tracks on this album (ba dum ching). Ok, I’m all punned out, I promise. 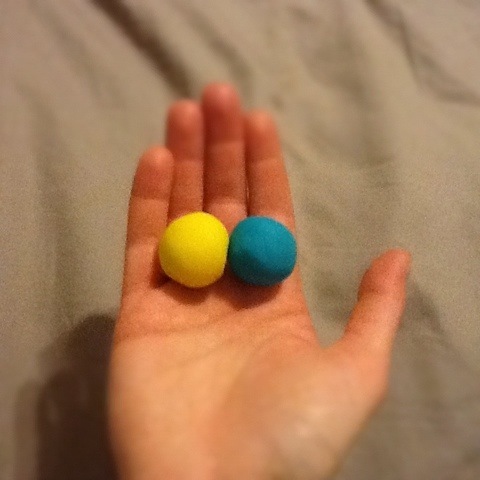 Track 10: Icky Sticky and Ooey Gooey is about 2 friends who like to play together. The only problem is Icky Sticky keeps getting stuck to various parts of Ooey Gooey. Kids love it. Actually if a person doesn’t like their song they’re probably a cyborg. Track 16: Tommy Thumb Is Up! is exactly what it sounds like. Just follow along with the lyrics, and you have a great storytime activity. The title track is one of the sillest songs ever. No kid can resist a silly song about stinkiness. In this song you’re making up a cake filled with all the stinkiest stuff you can think of: dirty socks, moldy fish, and dirty diapers. Come to think of it, this might make a good flannel board! Flannel aside, when you play this one, make sure to hold your nose, and emphasize how grody each cake is. I’ve done a flannelized variation of this song featuring farm animals. However, there’s something about Peterson’s version that tickles my funny bone just a little bit more. For some reason, maybe because the animals are city-dwellers, I picture them wearing fancy clothes. It cracks me up. My storytimers go bananas for this cover of a Laurie Berkner song. It’s about a school of very confused little fish. They wake up from a nap and decide to do some very unfishy things: riding bicycles, taking showers, and brushing teeth. Then the stop, “Wait a minute! We’re fish! We don’t ride bicycles! Let’s go swimming. 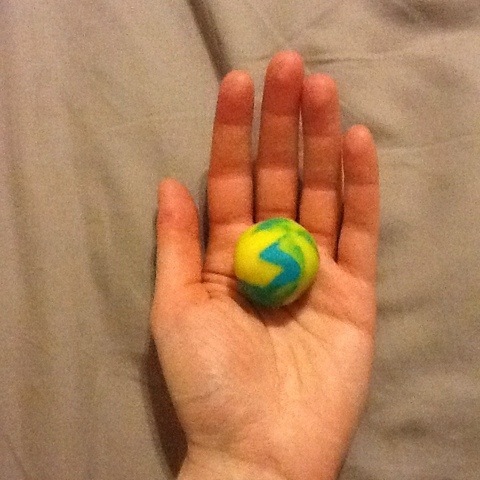 There’s no trick to this one, just act it out, and you’ll all have a ball. This song is a little like Flip-Flap Jack. It’s about a weird old, who has spaghetti for hair, and a flower for a nose…etc. This would make a great flannel board song. So find Stinky Cake by Carole Peterson, and you won’t regret it. 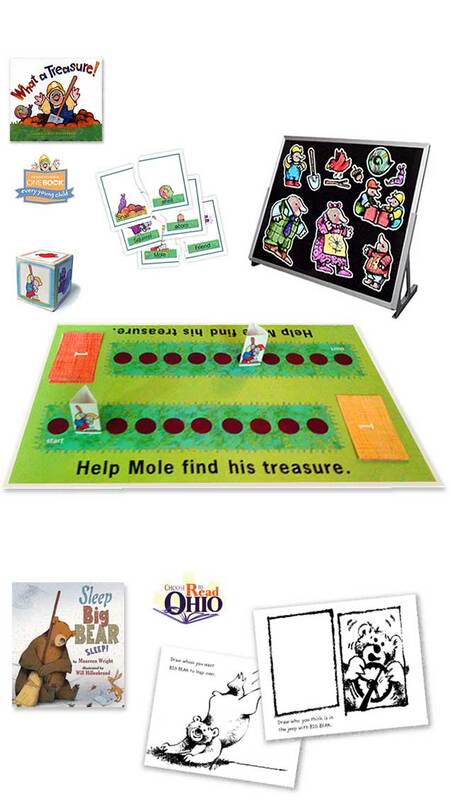 Categories: ALL, Bibliobop (music in the library), Early Literacy | Permalink. This idea has been marinating in my brain for quite a while… With all the children’s music out there, it’s a tough to slog through your library’s collection to find the right music for storytime. Believe me, I know from *recent* personal experience. I’m in the middle of a major slog-athon right now in preparation for a new “Campfire Sing-Along” program I put on our 2012 summer calendar. Side note: About 2 years ago, I started a program we call “Bibliobop”, and it’s been pretty popular for from the get-go. I decided to try a the sing-alongs this summer. It’s somewhere between a storytime and a dance party. It will still be a program you can grab and go (a playlist on the department’s iPod + 1 book), but with a little more structure than a dance party. I’m pretty close to a final mix. I should have it by the end of the week(?). I’ll post it when I do. I’ve been meaning to do this for a long time: Must-Have Music Monday. 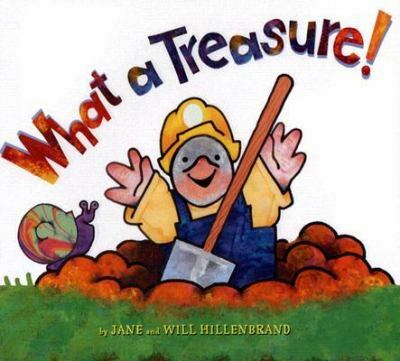 Each week (give or take) I’ll feature a storytime CD that no storytime room should be without. songs should be 85-98% chorus… This may sound weird but repetition is the sweet spot when it comes to storytime music. This CD is wall-to-wall storytime awesomeness! Super-cute song for Babytime. If your library does a small-group baby lapsit this would be a great bouncing song. It’s a pretty rigorous bouncing song, so make sure your group is in the mood. 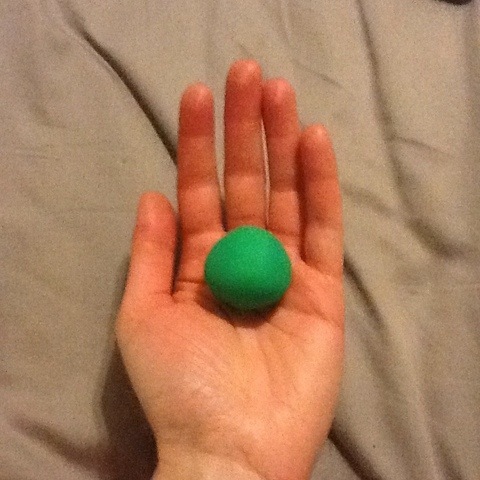 Sit in a circle, follow along with the song (this will work especially well if you use a demonstration doll) as it plays. 2. Hurray For My Face! Very silly song it would be perfect for toddler time preschool storytime. Have the kids touch the various body parts mentioned through out the song. I might try making a flannelboard to go along with this song, and build a body as the song plays. This is ideal for an English-Spanish storytime. This would work with babies, toddler, preschoolers. I would stand in a circle and follow along with the lyrics (first in English, then in Spanish). Grab your favorite dog puppet, and wag his tail, scratch his ears, let him give you a kiss, and hug him as the songs instructs. Pass out rhythm sticks, and use them to knock on the door. Then make the various animal noises when the time is right. This is a super silly crowd-pleaser. You can do it in English and/or Spanish. This is an awesomely silly song. Who doesn’t like make monkey noises? It’s really fun to get very dramatic during the verses: climb, fall, look around… as you look for your bananas. 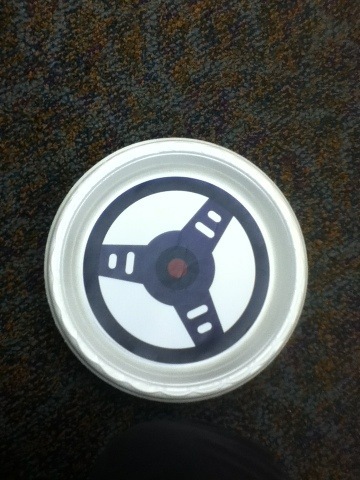 I made these steering wheels a while back for a book called In The Driver’s Seat by Max Haynes. These would also work for this fun, adorable song. I would use this in toddler time and preschool storytime. Show off your big dinosaur feet, teeth, claws, and so forth. It’s good for just about any age group. I might also make a “build a dino” flannelboard to go with this song. It’s a fun one. 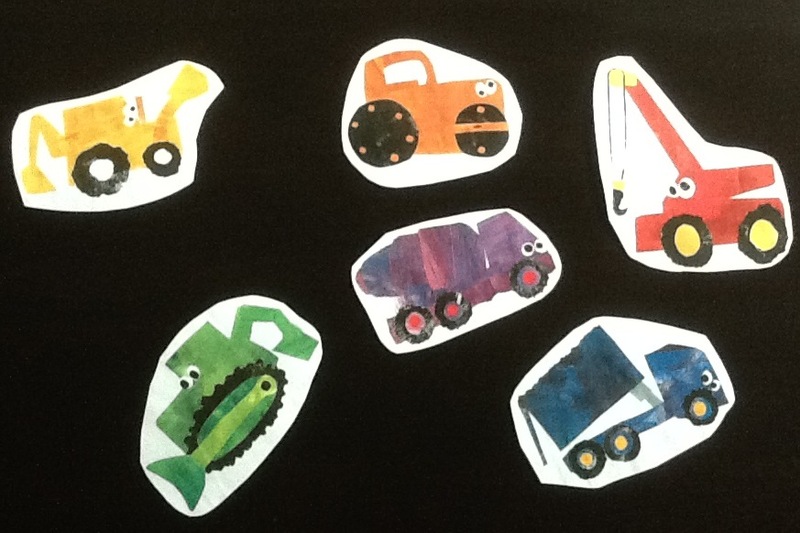 This is a decidedly flannelless storytime activity I like to use when the theme is color. It pair perfectly with one of my all-time favorite stories, with Mouse Paint. It’s one of the simplest ways to provide a hands-on experience with color blending. Libraryquine is hosting this week.